The SSC team of Jagranjosh.com has prepared a set of 25 similiar questions taken from the various previous examinations i.e. IBPS, RBI, SSC and other exams. We found that previous year questions are more likely to be repeated in the exams like SSC CGL and etc. go through each one of them.. The SSC team of Jagranjosh.com has prepared a set of 25 similiar questions taken from the various previous examinations i.e. IBPS, RBI, SSC and other exams. We found that previous year questions are more likely to be repeated in the exams like SSC CGL and etc. During solving these questions, keep time limit in mind for mastering in these examinations, especially. As quantitative section requires the following attributes from you. - Different and shortcut tricks to solve questions and etc. 1. A 320 m long train moving with an average speed of 120 km/h crosses a platform in 24 s. A man crosses the same platform in 4 min. What is the speed of man in m/s? 2. The simple interest accrued on a sum of certain principal is Rs 7200 in six years at the rate of 12 p.c.p.a. What would be the compound interest accrued on that principal at the rate of 5 p.c.p.a. in 2 yrs? 4. The sum of 8 consecutive odd numbers is 656. Also average of four consecutive even number is 87. What is the sum of the smallest odd number and second largest even number? 5. Seema purchased an item for Rs 9600 and sold it for loss of 5 per cent. From that money she purchased another item and sold it for gain of 5 per cent. What is her overall gain/loss? 6. What was the total number of failed candidates from school-C in the year 2008 and the number of candidates who appeared in the exam from school-D in the year 2006? 7. 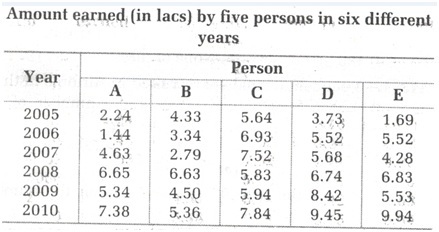 In which year was the difference between the number of candidates who appeared and passed in the exam from school-B second lowest? 8. What was the respective ratio between the number of candidates who appeared from school-C in the year 2006 and the number of candidates who passed in the exam from school-D in the year 2009? 9. Number of candidates who passed in the exam from school B in the year 2005 was approximately what per cent of number of candidates who appeared from school-A in the year 2008? 10. What was the approximate percent increase in the number of candidates who passed in the exam from school-A in the year 2009 as compared to the previous year? 11. What was the average number of soldiers recruited in the Navy overall the years together? 12. 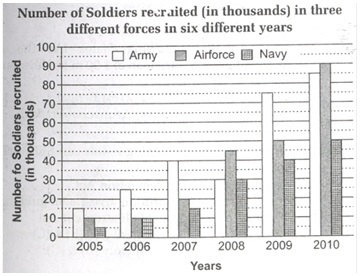 Number of soldiers recruited in Navy in the year 2009 was what percentage of soldiers recruited in Army in the year 2006? 13. If 30 per cent of soldiers recruited in Airforce in the year 2010 was female then what is the number of males recruited in Air force in that year? 14. What was the respective ratio between the number of soldiers recruited for Airforce in the year 2005 and the number soldiers recruited in Army in the year 2009? 15. What was approximate percentage decrease in number of soldiers recruited in Army in the year 2008 as compared to the previous year? Directions (Q. Nos. 16-20): Study the following Pie-chart carefully to answer these questions. 16. 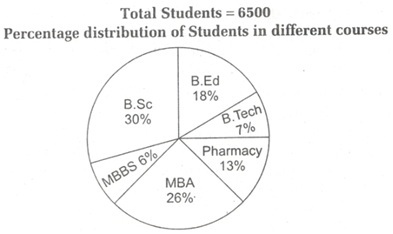 What is the value of half of the difference between the number of students in MBA and MBBS? 17. How much more percentage (approximately) of students are in MBA as compared to students in B.Ed.? 18. What is the total number of students in B.Ed., Pharmacy and MBBS together? 19. What is the respective ratio between the number of students in Pharmacy and the number of students in B. Tech? 20. Number of students in B.Sc. is approximately what percentage of the number of students in B.Ed.? Directions (Q. Nos. 21-25): Study the following table carefully to answer the questions that follow. 21. What was the average of the earning of Person-B in the year 2006. C in the year 2008 and E in the year 2005 together? 22. What was the respective ratio between the amount earned by Person-B in the year 2007 and Person-D in the year 2010? 23. What is the approximate per cent increase in the amount earned by Person-D in the year 2010 as compared to the previous year? 24. Whose earning increased consistently from the year 2005 to the year 2010? 25. Total amount earned by Person-A in the year 2006 and Person-C in the year 2010 together was approximately what per cent of the amount earned by Person-E in the year 2009? For answers key, visit the link. For more practice, you can buy the online test.